I'm a self-confessed Black&Gold whore, with a secret fetish for anything with a hint of 80's tack/ OTT, so I usually find myself drawn to Donatella and her Versace creations. ... I was delighted when I laid eyes on the cover of Style magazine. 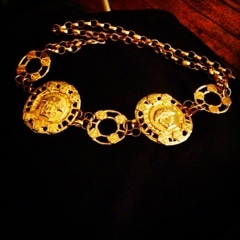 Medusa belts galore! Just wanted to take a moment to pay homage to the glamour of the new Versus Versace J.W. Anderson Collection. 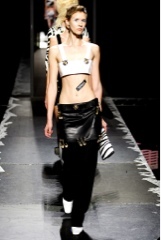 The omni-glamour, thigh-high splits, PVC and crop tops will forever hold a place in my heart- and my wardrobe.